Apple late Thursday took its online store down for maintenance as customers prepare to flock to the site in a few hours to preorder the latest iPhone and Apple Watch hardware. The online storefront went down at around 5:45 p.m. Pacific as Apple makes ready for an expected rush of iPhone XS, iPhone XS Max and Apple Watch Series 4 orders. Customers attempting to visit the page are met with a new landing page that features the text "Be Right Back" below an animated Apple logo. Apple is scheduled to bring the site back online on Friday at 12:01 a.m. Pacific, when preorders for the latest iPhone and Apple Watch devices kick off. Introduced at a special event on Wednesday, iPhone XS and XS Max are the successors to last year's popular iPhone X flagship. Powered by the new A12 Bionic processor, the handsets features full-face OLED displays -- 5.8 inches for the XS and 6.5 inches on XS Max -- advanced dual-camera arrays, increased water resistance and more. Carried over from iPhone X is TrueDepth, the specialized depth-sensing camera system that underpins Face ID, which gets a bit snappier in 2018 thanks to tweaked algorithms and a faster secure enclave processor. The A12 Bionic boasts two high performance cores Apple claims is up to 15 percent faster than last year's A11 Bionic, and four efficiency cores that use up to 50 percent less power compared to the system-on-chip's predecessor. Apple's in-house designed GPU gets four cores, up from three in the A11, to boost performance by 50 percent. Most notable, however, is Apple's Neural Engine, an 8-core unit capable of conducting 5 trillion operations per second. Tapping into this computing powerhouse are specialized software and hardware functions including iPhone's camera system, which uses the Neural Engine to enhance Portrait Mode and Smart HDR photography. CoreML also gets a bump in performance thanks to its links to the new machine learning module. Both iPhone XS and XS Max include two optically stabilized 12-megapixel rear cameras with wider, deeper pixels for better low-light photos and an enhanced TrueTone flash. A new sensor sits behind the wide-angle shooter, which boasts an f/1.8 lens, while the telephoto camera features 2X optical zoom and a f/2.8 lens. Like last year, the handsets are capable of capturing 4K video at up to 60 frames per second. Stereo audio recording is also a welcome addition. Other upgrades include dual-SIM support, 120Hz display technology and wider stereo speaker separation. The iPhone XS will sell for $999 for 64GB of storage, with a 256GB model retailing for $1,149, and a new 512GB option available for $1,349. The iPhone XS Max will sell for $1,099 with 64GB of storage, $1,249 for 256GB, and $1,449 for 512GB. Apple introduced its first major Apple Watch redesign with Apple Watch Series 4, squeezing larger OLED displays, greatly enhanced heart rate monitoring capabilities, a new S4 SoC and revamped internal sensors into a slimmer chassis. Starting with the screens, Apple says the nearly edge-to-edge displays are 30 percent larger than previous Apple Watch models. Despite the larger size, Apple managed to keep battery life consistent with last year's models by integrating LTPO technology. Taking advantage of the extra real estate are first-party apps and watch faces with redesigned user interfaces. Apple Watch's heart rate sensor has been completely reworked to accommodate a new electrical sensor capable of taking ECGs, useful for identifying potentially life-threatening issues like atrial fibrillation. Electrodes flanking the optical heart rate sensor pair with a redesigned Digital Crown that receives electrical signals sent across a user's body, from wrist to fingertip. Apple was able to secure clearance from the FDA for both the ECG and aFib detection. In addition to playing an integral role in ECG readings, the new Digital Crown now supports haptic feedback. Apple Watch's speakers have been redesigned to be 50-percent louder, while its microphone has been relocated to boost audio quality. Internal sensors have also been upgraded, affording higher degrees of accuracy. Apple takes advantage of the new capabilities by integrating unique features like fall detection. Instead of different models of the Apple Watch using different composite materials for the backs depending on model, all models of the Series 4 will come with ceramic backs, a material that affords better cellular transmission and allows for the advanced cardiac monitoring that the device now provides. Apple Watch Series 4 will be available in 40mm and 44mm sizes. The usual silver, gold, and Space Gray aluminum hues are back, while stainless steel versions will be sold in silver, Space Black and a new gold color. Nike+ models with special watch faces and bands are also available. Prices start at $399 for 40mm aluminum versions with GPS, while 44mm models go for $429. Aluminum models with cellular connectivity sell for $499 for 40mm and $529 for 44mm. All stainless steel models include GPS+Cellular capabilities and start at $699 for 40mm sizes and move up to $749 for 44mm. Going to get the Max and hope it doesn’t feel as terribly big as the 6plus did when I tried and returned at launch. They say it doesn’t 🤷🏼‍♂️ Upgrading from iwatchO to the 4 cell and stainless too. I’m actually a little disappointed I have no use for the Nike+ Band with reflective thread. It’s one of those things I think is clever and kinda cool but don’t have a need for. I love my Nike+ Sport Band, though. It’s definitely my favorite to workout with. Already set my alarm so I can be up and ordering a Series 4. I’m on iUP so still have one more month before I “need” to upgrade my X. I like the new update it I’m also happy with my current iPhone so I don’t feel I need to make an extra payment AND frantically try to order. I’m fine with waiting until next month or so. Side question: does anyone have an idea of how an aluminum Space Gray Series 4 would look with the Space Black Link Bracelet from the Series 0? I have the SS Series 0 with that band. I typically only wear it out to dinner as I find the weight of my aluminum Series 3 much more pleasant to wear all day and especially to workout in. I was thinking a Space Gray aluminum may look decent with the Space Black Link Bracelet, but maybe they’re way off. I’m curious, wouldn’t my arm cause a massive amount of signal attenuation? How is this different than my hand causing same when holding my phone? Xs Max, 256GB gold. And Watch, stainless steel black. Time to order my first Apple WATCH. Nike+ Space Grey. Hopefully it doesn't take long for the ECG feature to be enabled in Australia. I will do everything short of jailbreaking it to get the feature to work though. Hopefully it will just be a matter of changing the region. Even without the ECG though the Series 4 looks like a fantastic Watch. Can't believe NO Gold color for XR ? That Coral color is no replacement for Gold. Apple always have to do some wired thing. The Xr preorder is not tonight. XS Max, color unknown. Watch Black Cellular. Upgrading my series 0 watch to 4, and phone to XS. Really wish they still did jet black iPhone. 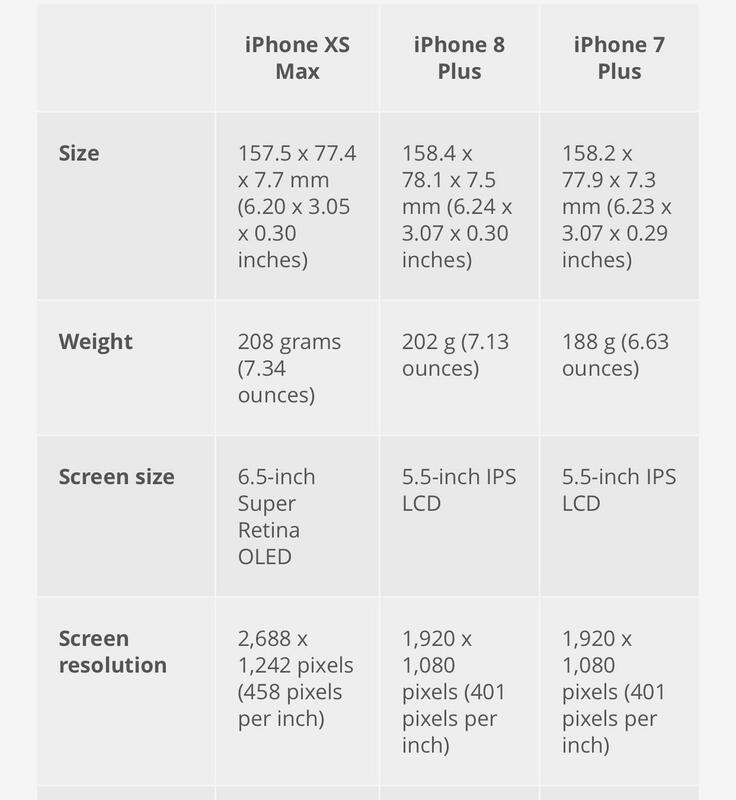 Dude, XS Max and 6+ have virtually the same dimensions. Apple people don’t call iwatch...damn it’s been 4 years! Same phone. Nike 44mm grey aluminum here. Nike Series 4 with LTE (my wife has series 3 with LTE, I'm so jealous, I've been wanting LTE for a while but wanted to hold out for the 4), I like the look of the white band and silver case, but don't know if that will be a little 'loud' for day to day use. Can always switch out the band though. Might just go with all black like i did with my series 2. First time since I've been an iPhone user (since the 3GS) that I will not be upgrading this cycle. Got a X last year and it's still working just fine. Although the improvements are nice, not enough to entice me for a new phone this time around. I'm very curious to see what the XS Max looks like in person. I had a 6 Plus and a 7 Plus and it was hard to give up the Plus size for the X but now that I'm used to it, it just feels like the perfect size. But maybe I'll consider the XS Max if I'm blow away in the store, just no pre-order tonight. AW4 in stainless steel. Wont be activating the cellular just like with my current AW3. My AW0 stainless will need a new home...probably sell it for a few shekels if anyone's buying. Apple does $25 for it now lol. The Nike Sport AW4 gets $225 from them. XS Max is actually a little thicker. Everything else is pretty much the same size. Looks like Verizon preorders are going up a few minutes before midnight. Preordered mine on Verizon at 11:57pm. iPhone Xs Max Space Gray delivers 9/21. I can't wait until next week. 12:04am in California. Apple online store is not live. Patience is difficult. Update: site is live at 12:06. Order placed quickly with no connectivity issues. Wow. The fastest ever! IPhone done at 3:04, Watch 3:07. Expensive morning. Agreed, super simple and very fast, after the store came up a few minutes late. Grrrr. Went with Silver Aluminum LTE, 44 mm.